it is one of two major daily newspapers in Melbourne, Australia. It is published by Fairfax Media Limited. The other newspaper is the Herald Sun which is part of Rupert Murdoch's empire. will be held in Melbourne this week-end. Refugee policy - and its inherent cruelty - is a major issue. In case anyone has forgotten, it was the Australian Labor Party that introduced banishment to Nauru and Manus Island as a way of halting the flow of boats carrying asylum seekers and economic migrants to our shores. And it was Labor under Kevin Rudd that declared "asylum seekers who come here by boat will never be settled in Australia". That uncompromising "solution", as some might glorify it, has been the most profound deterrent on people-trafficking in this region. Turning back boats was an addendum to that policy. 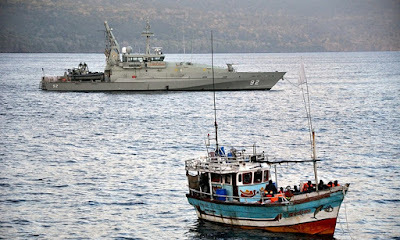 It was introduced by the Abbott government in late 2013, initially by towing boats to Indonesian waters, then transferring people into orange vessels and pointing them back to Indonesia. Later variations include detaining people on Australian vessels in international waters before handing them to authorities from other countries; using Australian naval vessels to sail asylum seekers directly to ports in their home countries; and, more recently, paying cash to persuade an Indonesian boat crew to turn their boat around and go back. None of this is acceptable. Not the offshore processing system, nor the eternal banishment from Australia. Not the reprehensible prison-like conditions on Nauru and Manus Island, which are designed to crush people's spirits and, thus, deter others who might attempt the ocean journey. And certainly unacceptable, in our view, is the interception, towing or turning back of boats, let alone handing people back to those same countries which they believe perpetrate persecution, are complicit in such oppression, or are unable or unwilling to protect them from harm and discrimination. Bill Shorten this weekend will ask the Australian Labor Party's national conference to formally approve a dramatic shift in policy and adopt the turn-back strategy of the Abbott government. We believe the policy is morally repugnant, and that Labor's rationale is flawed. Richard Marles, Labor's spokesman on immigration, contends that while most people who attempt the sea journey from Indonesia to Australia are genuine refugees, this final leg "is not a flight from persecution. No one is fleeing persecution in Indonesia". This is simplistic rubbish. Ask Papua New Guinea about refugees who have fled oppressive authorities or racial and religious violence in West Papua and other eastern provinces. More importantly, however, we remind Mr Marles that superior courts around the world have confirmed repeatedly that it does not matter whether a refugee has come via one country or many to seek asylum. The claim must be assessed, on its merits, by the country where it is sought. We believe this nation should uphold its obligations under international law, with respect paid to the needs of each person who seeks assistance. For that reason, The Age does not support turning back asylum seeker boats. Repelling people at sea, or depositing them in other countries, prematurely terminates their claims for protection. This is a ruthless and despicable relinquishment of Australia's obligations. While the offshore detention system provides for some processing of refugee claims, it is terribly flawed, not least in principle. We believe in justice, and in extending compassion and dignity to people who seek refuge. To that end, we believe processing of refugee claims and detention arrangements should be conducted in Australia, by Australian authorities, and with the prospect of permanent settlement here for those who demonstrate legitimate claims. The Age is not naive enough to presume that this could be adopted without the risk of a sudden flood of boats heading to our shores. It is why we have always argued for a regional solution, rather than a Fortress Australia mentality. If Labor adopts Mr Shorten's proposal, it will suggest a party that too readily ditches important principles for political gain.